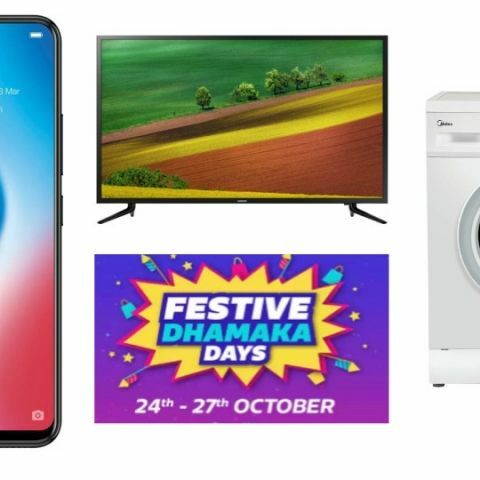 Flipkart Festive Dhamaka Days will kick off from October 24 and will last till October 27. Here we have put down the best deals Flipkart has revealed on their platform so far. After the Big Billion Days Sale, Flipkart is back with another sale called Festive Dhamaka Days. The sale will open for everyone from tomorrow, but the e-commerce giant has already started teasing customers. During this sale, Flipkart is offering 10% instant discount to buyers when they will make payment via an Axis bank debit/credit card. In this lister, we have jotted down the best deals Flipkart is going to feature on this sale on gadgets like TVs, smartphones, and more. The Lenovo K8 Plus sports a 5.2-inch FHD display with a resolution of 1920 x 1080 pixels. The smartphone comes with a dual 13MP + 5MP rear camera along with an 8MP unit on the front. The smartphone was launched in India at a price of Rs 10,999. During this sale, you can get this device for Rs 6,999. If you have an Axis bank debit or credit card then you can also get an instant 10% discount on your purchase. Check out the deal here. The Vivo V9 64GB variant will now be available during Festive Dhamaka Days sale for Rs 15,999. The smartphone has a full HD+ 6.3-inch display, which offers a resolution of 2280 x 1080 pixels. The phone is powered by a Qualcomm Snapdragon 626 octa-core processor. Check out the deal here. The Oppo F9 was launched in India at a price of Rs 20,990. During this sale, the phone will be available for Rs 18,990. The device comes with a 6.3-inch FHD display and a dual-rear camera setup. Check out the deal here. If you’re thinking of purchasing a TV for your home then this might interest you. The Samsung 32-inch HD ready TV will go on sale from tomorrow at a discounted price of Rs 15,990. One can also avail no-cost EMI along with an exchange offer. Check out the deal here. The Midea 7KG Fully Automatic front load washing machine is crom carrier, and will be available at a discounted price of Rs 13,999 during the sale. Check out the deal here.